For 13 years, Spaceflight Now has been providing unrivaled coverage of U.S. space launches. Comprehensive reports and voluminous amounts of video are available in our archives. Astronauts Rick Mastracchio and Mike Hopkins returned to the International Space Station's airlock Saturday to wrap up a successful five-hour 28-minute spacewalk, the first of at least two excursions needed to repair a critical coolant loop. Running well ahead of schedule, the astronauts decided to call it a day instead of pressing ahead with additional work planned for a second spacewalk Monday and began repressurizing the station's Quest airlock at 12:29 p.m. EST (GMT-5) to officially end a virtually problem-free spacewalk. Mastracchio and Hopkins successfully disconnected a faulty ammonia pump module, removed it from its rack in the station's solar power truss and maneuvered it to a mounting fixture to clear the way for installation of a replacement pump module Monday. There were no indications of any water leaks in either astronaut's spacesuit like one that triggered a frightening abort during a spacewalk in July. The original flight plan called for Mastracchio and Hopkins to simply disconnect the old pump during the initial spacewalk and to remove it during the second outing. But the spacewalkers had no problems disconnecting ammonia lines and power cables and flight controllers told them to go ahead and remove the refrigerator-sized pump module. All of that went off without a hitch. 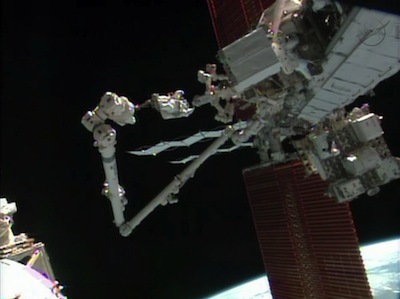 Anchored to the end of the International Space Station's robot arm, Mastracchio had no trouble pulling the 780-pound ammonia pump module from the power truss, holding it in place over his head while arm-operator Koichi Wakata, working inside the station, moved him to the mounting fixture. A few minutes later, the pump assembly was safely locked in place, completing the first phase of work to repair coolant loop A, one of two used to dissipate the heat generated by the station's electrical systems. 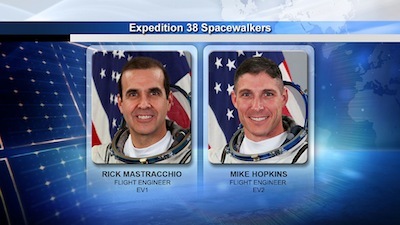 Other than an early comment about cold toes, Mastracchio and Hopkins had no complaints and nearly five hours into the excursion, mission control asked how the spacewalkers felt about moving outboard along the station's solar power truss to prepare a new pump module for installation Monday. The astronauts earlier agreed to extend the spacewalk an hour or so. Without giving any reasons, Mastracchio said he would prefer to end today's spacewalk after securing tools and tethers. "OK, so basically all we could do is open MLI (insulation blankets) and break torque (on attachment bolts), is that it?" Mastracchio asked. "Possibly cap removal and removing the tape from the electrical connectors as well, and we're breaking torque on the bolts as well, yes, and it'll help us with some get aheads and put us in a good config for the second EVA," Wheelock said. "Yeah, my vote would be to call it (off) for today, but it's up to you guys if you really want to go out there," Mastracchio replied. "And Rick, could you give us some ideas if it's temperature, your (suit) temperature?" Wheelock asked. "It's just, more a couple of things," Mastracchio replied, without providing any details. "Copy all, Rick. And standby, we'll have further words for you in just a minute." "I assume we could add those tasks and still get them all done on EVA-2, correct?" Mastracchio asked. A few moments later, Wheelock told the astronauts, "OK, guys, we're going to wrap it up and just do some cleanup here now." Given how far ahead of the timeline the crew got, flight controllers are still hopeful the astronauts can complete the pump swap out Monday, avoiding a third spacewalk on Christmas day. This was the 175th spacewalk devoted to station assembly and maintenance since construction began in 1998, the ninth so far this year, the seventh for Mastracchio and the first for Hopkins. As it now stands, 114 astronauts and cosmonauts representing nine nations have logged 1,100 hours and seven minutes of spacewalk time outside the International Space Station, or 45.8 full days. Mastracchio's time outside during his seven spacewalks totals 43 hours and 58 minutes, moving him up to 15th on the list of most experienced spacewalkers.